I am writing to express my outrage at the Turkish military aggression against Syrian Democratic Forces in Syria (SDF). At a decisive moment when ISIS caliphate is waning in its last citadel and capital Raqqa, the Turkish military has repeatedly assaulted SDF and civilians in the Afrin Canton and its surrounding villages; as a result of which, many have been killed and wounded, prompting tens of thousands of people to march against the threat of Turkish invasion and in defense of SDF for their role in maintaining peace , a multiethnic democracy, and a safe sanctuary for refugees in the region since 2014. During all this time Turkey has imposed a relentless economic blockade on the region and has even repeatedly cut off the flow of water to the region, indispensable to the region’s agriculture and electricity. Dear senator, it is evident that the sporadic attacks are testing the tolerance of the international community as Turkey is preparing for launching a large-scale war under the pretext of security threat. As you know the planned invasion is bound to derail the war against ISIS, as SDF will be facing another existential threat. SDF has paid a very high a price to create a safe haven in vast areas in North and Western Syria liberated from the yoke of ISIS and jihadist forces that Turkey has directly and indirectly supported. Although our government has expressed concern over the Turkish incursions; such egregious violations require a stronger reaction beyond diplomatic maneuvering. The Anti-ISIS Coalition has a moral responsibility to defend its true allies and confront Turkey in defense of tens of thousands who have fallen victim to the Turkish nationalist- Islamist ideology both in its contemporary and not such a distant past. Concrete actions such as depriving Turkey of economic, political, or military support would send a clear message to Ankara in the same way that California State Assembly’s adoption of divestment resolution advanced by the Armenian National Committee of America Western Region and Armenian Youth Federation Western Region for divestment of California public funds from Turkish government for the first time held Turkey accountable for its continued denial of Armenian Genocide and its continuing violations of human rights in Turkey. You recently along with your colleagues rightfully took a clear stance against the ferocity with which president Erdogan’s security officers violated the law of our land and attacked peaceful demonstrators in Washington. What we observed in horror is an extension of the Turkish ruling party’s policy in silencing its critics and human rights activists, the latest example of which is the detention of the entire Amnesty International personnel in Turkey. As Turkey continues to assail the US for supporting “terrorists” in Syria, academicians are sacked and jailed, repressive measures are taken against tens of thousands falsely accused of complicity in the last year’s coup. Every critic is labeled a “terrorist” in the Turkish rhetoric within and outside its borders. This is how Erdogan waged a dirty war against Kurdish cities in Turkey, many of which have been left in ruins and some in a perpetual state of siege as hundreds were killed and tens of thousands were expelled from their homes. The Pro-Kurdish People’s Democratic Party (HDP) is carrying the brunt of the repression as 11 of its lawmakers including the co-chair Selahattin Demirtaş and over 80 of its mayors have been imprisoned on the ubiquitous charge of “ terrorism. 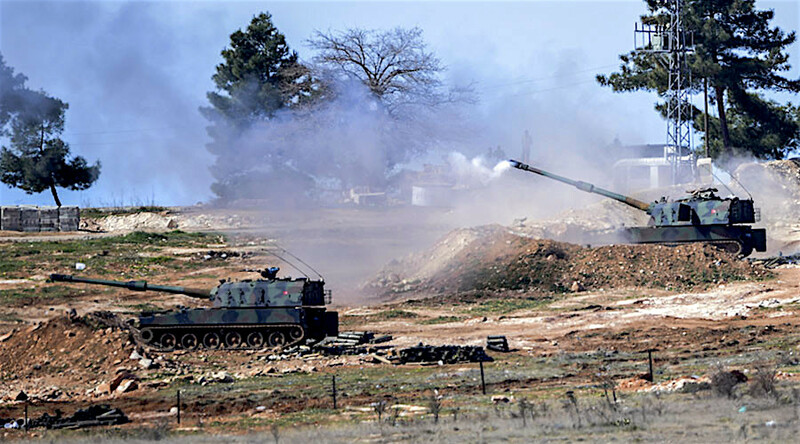 Turkey is now extending and expanding its war against Kurds beyond its borders through these military campaigns. As the US and Europe continue to support SDF as the most effective force against ISIS, I urge you as a vocal advocate of human rights and international law to condemn and oppose the Turkish political machinations and military aggression. Any concrete initiative from your office in California and Washington would send a resounding message against the imminent Turkish aggression, an invasion which would not only threaten the anti-ISIS fight for the recapture of Raqqa but will escalate and expand the catastrophic war in Syria.